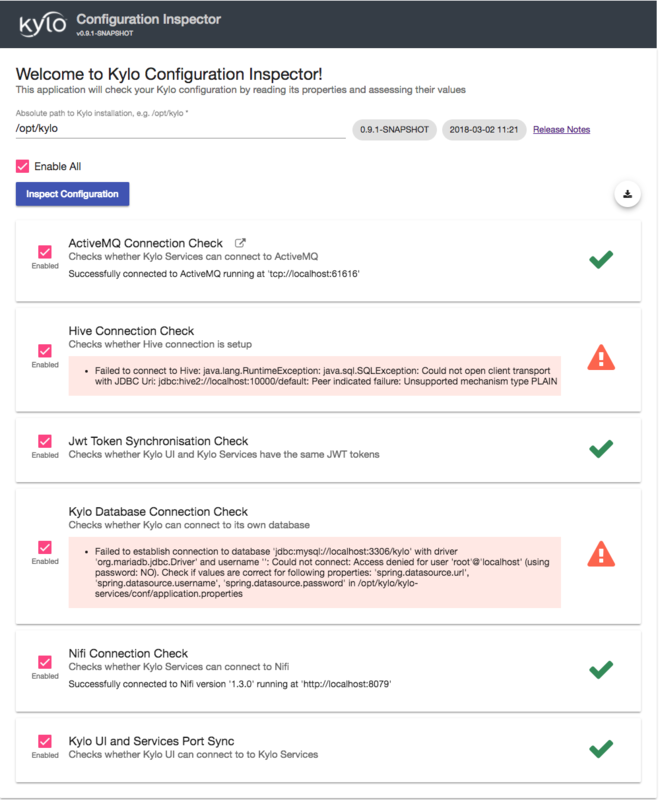 Configuration Inspector App is a standalone application, separate from Kylo UI and Services and its purpose is to check whether Kylo UI and Kylo Services are configured correctly or not. It comes with a number of Configuration Inspections out-of-the-box and is designed to be easily extensible. Once the service is running, open your browser and find Inspector App at http://localhost:8099. Find the logs in /var/log/kylo-install-inspector. Click the circular “Download Report” button closer to the right top corner just above the Inspections list to download and share the inspection report produced by Inspector App. Extend Inspection or AbstractInspection class found in kylo-install-inspector-api module. At minimum you will need to implement three methods where the one which does the work looks like this: public InspectionStatus inspect(Configuration configuration). Via Configuration class you get access to Kylo UI and Services properties, e.g. Configuration.getServicesProperty(String propertyName). You can either directly @Inject Kylo classes into your Inspections or you first create Spring configuration which defines the beans, e.g. see NifiConnectionInspection and NifiConnectionInspectionConfiguration which uses custom Spring configuration to get JerseyClient which can talk to Nifi. Add your jar and its dependencies to Inspector App classpath, i.e. drop them into /opt/kylo/kylo-install-inspector/inspections directory.